There couldn't be a fire along the Jorgmund Pipe. It was the last thing the world needed. But there it was, burning bright on national television. The Pipe was what kept the Livable Zone safe from the bandits, monsters, and nightmares the Go-Away War had left in its wake. The fire was a very big problem. Enter Gonzo Lubitsch and his friends, the Haulage & HazMat Emergency Civil Freebooting Company, a team of master troubleshooters who roll into action when things get particularly hot. They helped build the Pipe. Now they have to preserve it - and save humanity yet again. But this job is not all it seems. It will touch more closely on Gonzo's life - and that of his best friend - than either of them can imagine. And it will decide the fate of the Gone-Away World. Equal parts raucous adventure, comic odyssey, geek nirvana, and ultra-cool epic, The Gone-Away World is a story of - among other things - love, pirates, mimes, greed, and ninjas. But it is also the story of a world, not unlike our own, in desperate need of heroes - however unlikely they may seem. 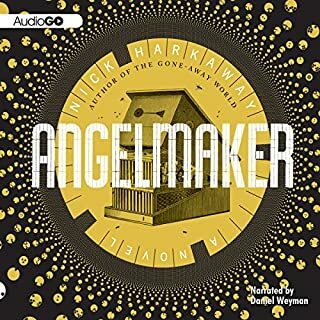 ©2008 Nick Harkaway (P)2008 Random House, Inc.
Just kidding. I have to agree that I enjoyed the book and it's action. The depth of theme isn't radical or stunning, but it's clearly about acceptance, tolerance and change. But forget that, there's mutants. Fire. Love. Betrayal. Bad guys. Good guys. The misunderstood. The changed. It's a grab a bowl of popcorn or hit the road trip audio book that explores our nasty corporate tendencies as well as our love for big loud trucks, shiny things and heroes. Fun. That's the ticket. And seriously, mutants make almost anything more interesting. Science fiction often makes me depressed with it's lack of originality - or flowing phrasology. Like I know?! This was just darn solid good fun. Grab your wheel and head for a tri-state road trip with it - you'll be there before you want. This is only vaguely science fiction -- the premise (a superweapon wipes out most of the world, leaving the heroes to pick up the pieces) is not terribly original and only acts as a framework for the real story, which is one of love and friendship, duty, and responsibility. But lest you think this is just an exercise in literary fiction masquerading as scifi, there are also lots of explosions and ninjas. Harkaway's writing -- many, many tangents, asides, inventive phrases, and other authorial indulgences, are the real attraction. If you like this kind of writing, you'll like this book, though if you're one of those people who likes Stephen King but thinks he needs to chop his books in half, you'll probably find this one overly-long also. The narration by Kirby Heyborne is nearly flawless. I'm not sure if I'd like his narration for another story, but he captures the tone of this book perfectly. 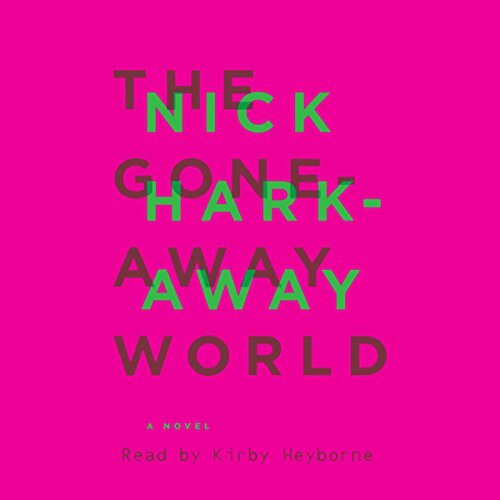 The Goneaway World is a novel that aspires to be a whole bunch of things at once. It's a breathless adventure story, with pirates, ninjas, mad scientists, and covert military units. It's a coming-of-age story about a young man and his best friend. It's a sardonic satire, criticizing the excesses of capitalism and militarism in a Kurt Vonnegut-like style. It's a post-apocalypse story. It's an absurd, Hitchhiker's Guide to the Galaxy-style romp, complete with a crack unit of mimes. It's a metaphysical tale about how "real" the things in our mind are. You'll either find this book delightfully witty or self-indulgent and exhausting. I leaned a little more in the latter direction. On one hand, I admired how clever and inventive Harkaway is, his effortless talent at satirizing human foibles and turning even the most mundane scenario into a madcap adventure (or the most exotic into something perfectly routine). On the other hand, the story careers around the map so wildly, I found it hard to care about any of the characters or what was happening. Even Gonzo, whom the protagonist is obsessed with (for reasons that become apparent later), is about as interesting as a video game character's user manual bio -- e.g. "Gonzo: a manly, cool-under-pressure guy with Polish parents and a stubborn streak." I eventually got bored with the story and all the tone switches, and stopped listening before I got to the final chapters, even though I'm sure there was an exceedingly clever ninja/pirate/mercenary/corporate honcho/mime battle I missed out on. 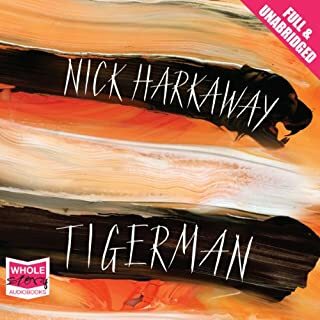 Don't get me wrong, I think Nick Harkaway is a smart guy with an impressive imagination. But he really needed the firm hand of a good editor here, who might have stopped him from running with arms waving after every butterfly that flitted past, and gotten him to have focused more on the novel as a whole. Still, other readers might enjoy the unrestrained zaniness more than I did. Doctor Who or Terry Pratchett fans, take note. Lots of dry British humor here. Clever, funny, and touching. With ninjas. It's hard to describe this book in more detail than what's on the cover blurb without giving spoilers. In theory, it's a post-apocalyptic science fiction/adventure story, but it's really about friendship, loyalty, doing the right thing, and ninjas. This is one of those books where it's the way it's written that is more entertaining than the story itself. The style may or may not be to your liking, as the first-person narrator goes off on many, many tangents. Witticisms and inventive euphemisms abound. None of it is strictly necessary for the story -- if you just want a rollicking adventure, this book takes a while to get there, and the adventure is buried beneath a lot of wordy prose that at times begins to sound like the author is just trying to impress you with his cleverness. However, it is clever and funny, and if style is important to you, this is a stylish novel. And there are some great characters. And ninjas. If you're hesitating because this book is 2 credits, take a chance, it's worth it. 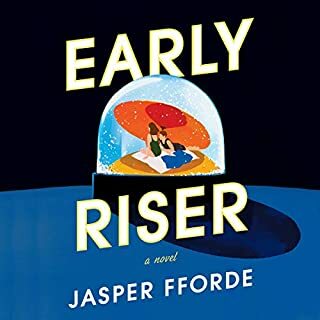 The story was entertaining on the surface, and many many fragments of it were so extremely good that I wished it was easier to rewind my iPod a couple of minutes, and that there was bookmark capability. The reader gave it just the right voice for the main character, and the other characters were effortless to differentiate. The reader added much and detracted nothing. I enjoyed the length of the book, it was by no means tiresome. I wanted more and more, and it begs for a sequel. 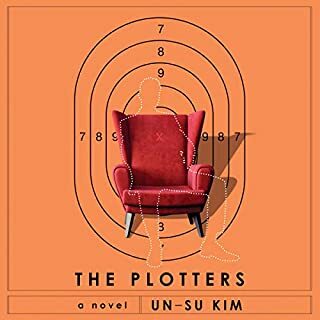 It has the elements of a dystopian apocalypse, a martial arts thriller, political intrigue, and a deeply current satire on the military industrial complex and corporate pathology, and interesting religious perceptions. It's extremely funny, and very credible in it's depiction of the protagonist's thought life. The science fiction is uniquely imaginative and entertaining, and the enjoyment continues throughout, without any boring backwaters. 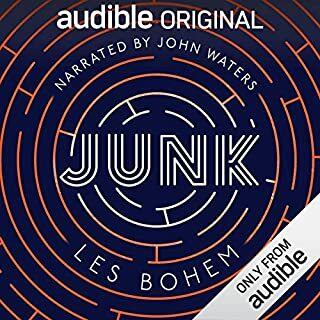 Best I've listened to of the many audio books I've heard over the years. Better than Dune, Stranger in a Strange Land, or Ringworld, from my point of view. I've listened to it several times, and played excepts for family and sent quotes to friends. But maybe I've oversold it just a little. Or maybe not. What made the experience of listening to The Gone-Away World the most enjoyable? Yes, the story is loopy, but it's so much fun. Well worth listening to twice - or even more. 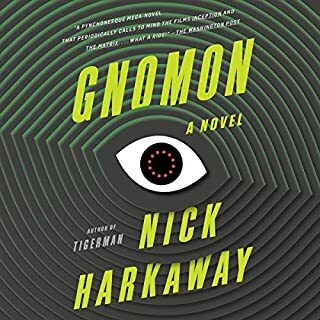 Harkaway brings something to Dystopian fiction that it seldom sees: - truly memorable characters, a wild, memorable story, and even worthwhile ponderings. Gone-Away has twists and turns that are well worth the effort it takes to getting your brain around. The narrator is superb. Wow! WOW! Completely wonderful, crazycakes novel! A story of love, friendship, loyalty, ninjas, revenger magicians, mimes and a mighty long pipe! Also kind of touching. Don't ruin it for yourself by reading any reviews. Unless you are an accountant or a worm geneticist, I think you'll love every moment. I didn't want to get involved in a whole review, but Kirby Heyborne's narration (it's a first-person narrative) in particular was so outstanding I just had to say something. Really gave it a fair shot but had to stop after the first 12 hours. So many flashbacks that I, more often than not, couldn't tell where/when we were or what was going on. Whole sections were passing me by without a clue as to whether we'd skipped ahead 10-20 years. As other reviewers have said, the detail is immense which I wouldn't mind if it didn't interrupt any semblance of plot flow. Basic questions introduced at the outset, like "what the hell is going on?" are only beginning to be answered 12 hours in. I wanted to like it, but realized that I wasn't engaged emotionally with anything and decided to return the book. Author is a fine writer, but the book is so so dense, maybe it's something you'd have to read instead of listen to. I liked the ideas and the characters in this book. But there were a few things that were a bit confusing and made it difficult to visualize. First is geography. They went from a war in a far off land to being at home without much in between. Secondly, the science is weak and unconvincing. The science behind the magic of it all. If you put your doubt or you desire for more explanation aside, you can enjoy an eventful, imaginative adventure with unexpected twists and fun characters.